Handiskips SA is a family owned and operated Adelaide based business. 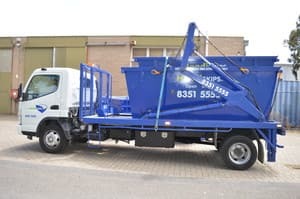 We pride ourselves on our friendly and reliable service, and ensure both our trucks and skips are in immaculate condition. We have an established reputation of providing an easy and stress free service to help you tidy up your waste. We operate 7 days a week and guarantee all of our skips have an access ramp, how Handi! Handiskips SA have a brand new fleet of specially designed skips. Every skip in the fleet has an access ramp and unlike the competition, Handiskips SA are longer and lower. This makes loading easy. This unique design also ensures safe transportation.